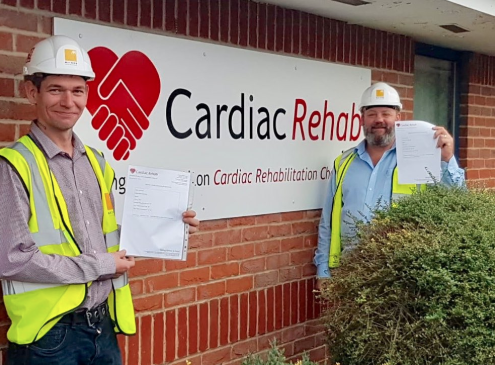 Throughout the construction of Alton Sports Centre, Metnor Construction has worked closely with Cardiac Rehab, and were proud to support their latest Staywell Schools celebration event. Cardiac Rehab has awarded 8 local schools the title of ‘Staywell Schools’ following their completion of a programme of health education and physical activity sessions as part of the school curriculum in the past year. Delivered partly by the charity team and partly by school staff, the children have learnt about how the heart works, the benefits of exercise and nutrition, and how our choice of food affects our hearts. On Monday 1st October, the Cardiac Rehab Centre played host to children from local schools in a celebration event. A team of children from each school took part in five activities which included running, skipping, star jumps, step-ups and hula-hooping, before being presented with ‘Staywell School’ certificates and a wall plaque for each school to have on display. The certificates and plaques were presented by centenarian exerciser, John Hayman. “We thought it very fitting that our 100-year-old exerciser should make the presentations to the children on our behalf!” said Denise Ellis, Centre Manager at The Cardiac Rehab Centre. After the presentation the children and their parents were provided with refreshments, which included a healthy fruit platter generously provided by Sainsbury’s, Alton. To end an enjoyable afternoon the children were given ‘goody’ bags from Everyone Active promoting afterschool activities at The Alton Sports Centre and including sugar free treats and a balloon. We were delighted to be supported in developing the Staywell Schools campaign and this event by Metnor Construction who sponsored the day as part of their continued support for the charity during the building of the new Alton Sports Centre. Commenting on the day, CEO Sarah Quarterman said: “This celebration was a wonderful way to end the Staywell School project year with children taking in part in healthy activities and receiving recognition for the learning they had achieved and also for the fundraising for Cardiac Rehab along the way. It was great to hear the younger voices in the Centre and for the youngest and oldest visitors to the building to be taking pleasure in the benefits for the heart of exercise”.